Last Wednesday I was playing chaperone. Four hours on a bus, not including two rest stops. And thirteen hours away from home. The last field trip of my baby's elementary school experience... I landed home exhausted with a splitting migraine and I wouldn't have missed it for the world. I left the big camera at home and snapped a few pics with my 3GS. Nothing spectacular, but memories captured all the same. Who knew a field trip could be so emotional. Or that parenting could make your heart literally hurt for no apparent reason? Turns out growing pains aren't just limited to tweens. Moms get them too... tomorrow I'll be at Pokey's school attending her 5th grade graduation ceremony... gonna try to be strong. If you'd like to follow me on instagram, you can find me @projectalicia. Or if you don't have a smart phone, you can follow me here. And please help me welcome my newest sponsor, JW Baugh Photography! They have beautiful fine art prints for purchase. Go take a peek! This is Wordless Wednesday, but as you can see Wordful or Not So Wordless posts are also welcome here. Just grab a photo and link up below! And if you'd like to connect with other WW participants, click HERE. My photos this week are from my iPhone too! I love having a decent camera in my phone! This is so cool! My kids would have loved it. I grew up about an hour away from Charleston, SC and have done that tour many times. I can tell you it will stir your emotions every time you go. WoW! Looks like lots of fun...I am looking forward to those trips with the kids! Looks like a wonderful time even tho it was a long ride and you ended up with a headache. =( These are priceless moments. Wonderful pictures to remember good times! Thanks for hosting and have a wonderful Wednesday. What an awesome trip- I love how you talked about growing pains for moms, pretty much hit the nail on the head. I remember when Son was in high school, I went as chaperone on several "field trips" - two of which were multi-day outings. One trip was to Pensacola FL, the other to the USS Lexington (in Corpus Christi, TX. We also had a one-day trip to San Jacinto and the USS Texas (which was interesting, since he was in AIR FORCE JROTC!) It was really fun, as at that age the kids mostly kept each other in line, and we got to (mostly) observe. nice trip! still amazes me what nice pics those phones take. Good times. I think it is wonderful Pokey's school took them to visit a carrier!! Sounds like a busy day. Love the memories you captured. I would have left my DSLR at home too. What a cool field trip! We don't get to go on many here. Your kids are so lucky to experience these types of trips! Great shots too! I just can't imagine not having my iPhone. All of the photos that I'd miss just because I didn't want to lug around my big camera. Sounds like a fun, yet exhausting experience. I can't believe I'm saying it but thank goodness for my iphone camera! With a busy toddler it's just so much easier to get candid shots at any moment. Trying to chase her around with one of my "real" cameras is tough and I usually miss the moment. I'm looking forward to field trips some day! I have visited there when we visited our relatives in Charleston!! Love it, especially having grown up a Navy brat. I think it was about 95 degrees every time we visited :-) but what else can you expect down south? Great pix!! Oh you made me home sick. We lived 15 minutes from there. We are now stationed in Germany. Great Photos. Simply BEAUTIFUL! LOVE being able to look at all your captures together!! These are great photos! Kids grow up so fast! Your daughter is soon starting 6th.grade? Time is just flying. Have a wonderful time tomorrow! Great results! Instagram can be such a great tool - I use it on Android and since it was upgraded by all the missing features I love it even more. You are very welcome to visit Travel Photo Blogging - The place to discover your next vacation destination. Great memories you captured there. My daughter is off on her first week long school sponsored trip to Colorado. The first text I got from her was "Glad you made me take my little camera". looks like it was a fun field trip. i remember chaperoning too, though we didn't spend 4 hours on a bus. wow! i find having the iPhone quite handy for photos, and they turn out pretty good. my photos this week are also from my phone...instagram is great! Love this collection. What a blessing that you could attend the field trip! Oh, you make me wish for an iPhone just so I won't have to take my big camera on field trips! The Yorktown and Patriot's Point is one of our favorite places to visit. We've only been four times! Love your instagram collage. Great photos!! I love photos taken with the iPhone, and there are some pretty cool apps to use to take them and enhance them as well. How fun- I love touring air craft carriers. They are so interesting. I did the USS Independence when it was still in service when it came in to Hawaii for RIM-PAC so many years ago when I was young & carefree. Then a couple years ago we took the kids to see the USS Midway in San Diego- really amazing that they had the technology to create what they did all those years ago. Looks like the exhaustion and migraine were worth it! Love all the shots! HAHA! Love taking trips with the iPhone cam!! Wonderful photos :) What a fun trip! Great Pics you have shared throughout your Blog! My hubby is ex-Navy and brother-in-law worked on WWII Memorial project! Happy WW to everyone too! Beautiful shots. :-) Thank you for the link up. Beautiful phot Have a great WW. I love that town. There is so much history there! If you have a chance someday to visit Savannah, GA it's full of history to. That's where I went to grad school. Great shots Alicia! The iPhone & Instagram is a great back up if you don't have your camera. Though these days, I do both. It's not unusual to see me photographing with iPhone first, Instagramming and then capturing a few more shots on my camera. Happy Graduation to Pokey. These are fantastic! And put into a gallery like this makes them even more poignant! Gotta stay strong for sure. I'm in the same boat with my daughter moving away this weekend (it feels like yesterday she was in kindergarten). You got some wonderful pics with your phone. Thanks for sharing them! My kids had their last day of school today and are rearing to get their summer started. I had to keep the tears at bay at my boy's 5th grade graduation/dance.Can't believe my first born will be a middle schooler next year. Yep, I'm pretty much addicted to Instagram. It's so much fun capturing the little things in life. Hey, because it's the little things that are the big things, right? I think so! Thanks for being a wonderful hostess. Can't wait to see what everyone else has linked up! Have a super day! Growing up is hard....for us moms! 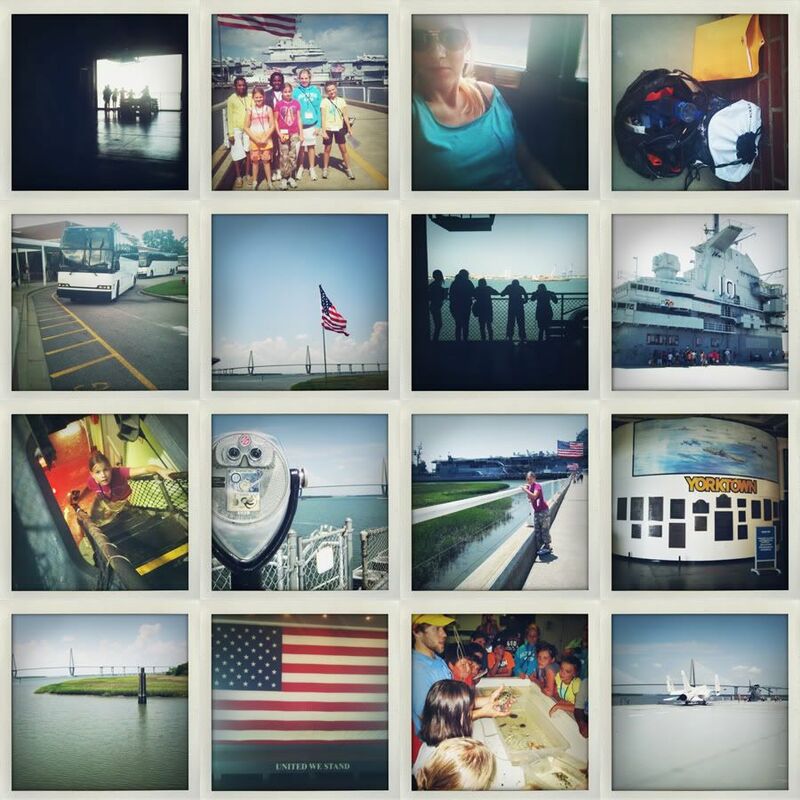 Lovely field trip photos and collage. The kids really grow up so fast. These are great shots. Sometimes I have to force myself to take the big cameras... the IPhone is so much handier especially when there is a lot going on! Joining in for the first time! You've created a wonderful collage. Perfect and patriotic for this past weekend. Great shots. I think using a phone makes them more interesting. A little more of a challenge since you have less control over the settings. I've been trying some cell phone HDR recently.